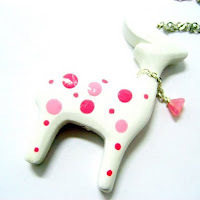 I am honored to be included in the following treasury Through Pink Colored Glasses by StormsHandicrafts. The treasury features all pink items. This matches the latest YART sale banner and avatar! How timely. Here are some of my favorites from the treasury! This hair pin is so pretty and sweet. I love the multiple layers of organza and different shades or pink with the tiny white pearls and beads. Beautiful. Perfect for wedding and bridemaids! I was so not into pink until a few years ago... 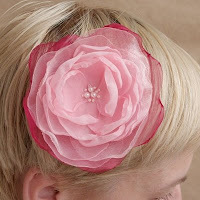 I now love pink and so I am admiring this treasury and *off to look* at the shops! This is such a pretty treasury. I love pink. Congrats on being featured, that deer is really cute. There is just something about pink that makes you feel good. Congrats on the treasury.